There’s been much talk about the Form 941, Employer’s Quarterly Federal Tax Return lately. With its 3rd Quarter deadline right around the corner on Tuesday, October 31, many employers have already completed their filing needs or need to do so within the next 12 days. In order to successfully file Form 941, one must submit very private information to match IRS records. With tax season being a prime time for phishing scams and fraud, it’s important to file with a safe and secured e-file provider like ExpressTaxFilings to avoid any form of tax-related identity theft. 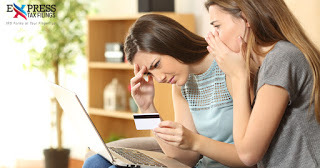 Tax-related identity theft happens when someone uses another person’s stolen Social Security number (SSN) or Employer Identification Number (EIN) to file a tax return to obtain a fraudulent refund. Protect Personal and Financial Records – Do not carry your Social Security card in your wallet or purse; only provide it when necessary. Keep your personal information protected at home and protect personal computers with anti-spam & anti-virus software. Lastly, routinely change your passwords for online accounts. The IRS won’t email you (directly) – Scammers often try to use emails designed to look as if it came from the IRS. Please know that the IRS will NOT initiate contact with taxpayers by email. The IRS won’t ask for your PIN – The IRS will never ask for your PIN or credit card information via email, text message, or phone call. Don’t Use Public Hotspots – Tax related or not, always be mindful when using the internet on a public hotspot. Limit public Wi-Fi hotspot usage to harmless things such as reading the news or checking the weather. Never use a public hotspot to log into accounts or access sensitive information. Other users on the network have the opportunity to intercept your credentials or data. Always log out – Be sure to logout of sensitive sites and services to avoid the possibility of others having access to your information if they use the same computer after you. IRS Letters – If the IRS identifies a suspicious tax return (with a taxpayer’s stolen SSN), the taxpayer may receive a letter requesting them to verify their identity by calling a special number or visiting an IRS Taxpayer Assistance Center. This is a legitimate request that should be followed through. Use Strong, Unique Passwords – Choose passwords that are difficult to guess and also use different passwords for different sites. Using the same password for multiple sites makes it easier for hackers to compromise many of your accounts. One last thing, always remember that the IRS will never initiate contact with you via social media or by text message. The first contact normally comes in the mail. Whether you are preparing to file your Form 941 Employer’s Quarterly Tax Return or any other form that we offer, be sure to utilize the useful tips listed above. Feel free to share with other business owners as well. Filing with ExpressTaxFilings is incredibly easy. All you have to do is follow the step-by-step guide to complete your form in a matter of minutes. You will be able to finish your form and transmit it directly to the IRS in no time. If you need any assistance during this straightforward and easy filing process, have no fear! We’re here to help. If you need any assistance give the dedicated, US-based ExpressTaxFilings support team a call anytime Monday – Friday from 9 AM to 6 PM EST at 704.684.4751. We’re also available via live chat and offer 24/7 email support at support@ExpressTaxfilings.com. I Missed The April 2nd Tax Filing Deadline, What Do I Do Next?